Ah, the teenage years. It’s a time defined by growing pains, raging hormones, and the constant, crippling anxiety that comes with thoughts of becoming a functioning, tax-paying adult. Perhaps most of all, it’s a time when describing what’s going on in your head, and why you’re feeling the way you feel at a given moment, can be one of the hardest things imaginable. Moods can flip in an instant, every little inconvenience can feel like life or death, and you have no idea what to do, where to go, and how to do it. That goes for most of us, at least. Lindsey Jordan, the 19-year-old Maryland singer-songwriter behind the band Snail Mail, somehow knows how to decode even the most overwhelming emotions into honest, uncomplicated songs better than most older artists. It’s this emotional maturity, first shown on the band’s 2016 EP “Habit,” that garnered her attention from hipster tastemakers and major establishments alike, building an impressive level of fandom for someone who still needed signed absentee slips to go on tour. On “Lush,” the band’s full-length debut, Jordan proves that the hype is well-earned by crafting shimmering songs of heartbreak, loneliness, and growing up that can speak to anyone of any age. 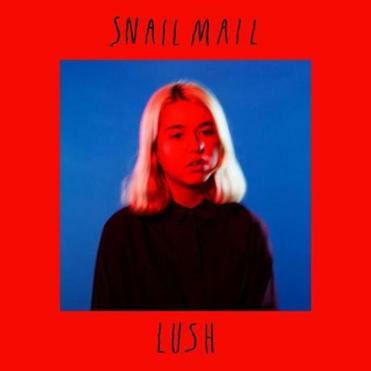 Couple the intricate guitar work with the open-book songwriting, and it’s no wonder why Jordan’s been compared to ’90s indie-rock staples like Liz Phair and Sleater-Kinney — but there’s more to Snail Mail than a nostalgia trip. Jordan exudes a level of confidence that’s all her own, never once flinching at the opportunity to reveal her feelings and insecurities, and it’s her insight and level-headedness that take her music beyond catchy earworms. Few songs balance pain and empathy as well as “Anytime,” in which Jordan sings to a former love, “In the end you could waste your whole life anyways/But I want better for you.” With “Lush” full of resonating moments like these, it’s exciting to think that Jordan’s only getting started. Robert Steiner can be reached at robert.steiner@globe.com.